Your potting should be just about completed by now; with only some Junipers that you haven’t gotten to, yet to be completed. This month’s activity is dominated by watering and trimming. With most trees, the new spring growth will be elongating fast. This indicates the time for trimming has arrived. For deciduous varieties, cut back to one or two leaves on vigorous trees and back to three or four leaves on those less vigorous. 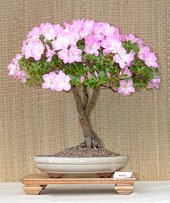 Healthy and vigorous trees will produce a better bonsai in a shorter time than a slow growing tree. A healthy, vigorous tree may require trimming, say three times during the growing season. Every time most deciduous trees are cut, two sub branches develop from the single branch. This means that a single branch will be replaced by eight sub branches by the end of the season. By wintertime, the tree will have much finer ramification that will be pleasing to the eye. Wiring may also be done at this time. Care should be taken not to apply the wire too tightly. Trees thicken quickly at this time of the year and the wire may grow into the wood. You should be into your regular fertilizing schedule on trees not potted this year. Do not fertilize newly potted trees for four weeks after potting. Regulate the amount of water for pines to control the size of new needles. Too much will encourage long candles. Give just enough water to maintain healthy trees. Finger pinch or cut soft growth on Larch to desired length. This will promote clusters of buds at the base of the new shoots. Begin to finger pinch Junipers to keep the new growth compact. Keep out weeds. At this time of the year, weeds will infest your pot very rapidly. 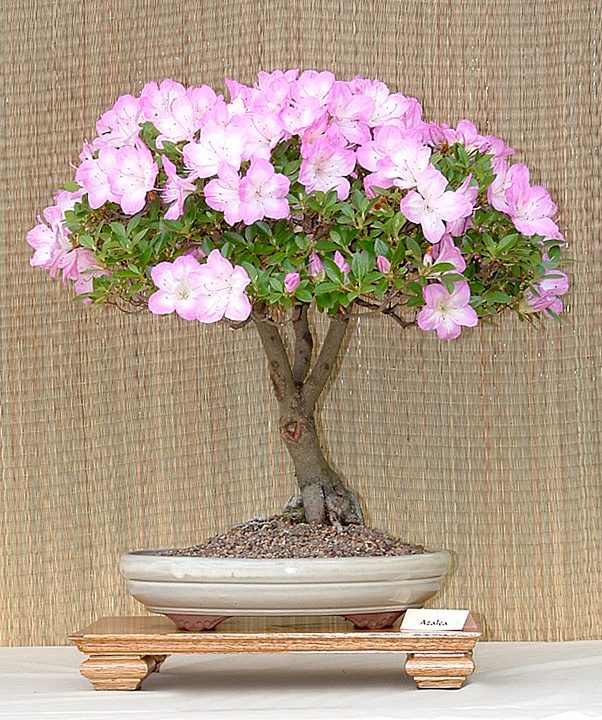 It is important not to let the situation get out of hand and rob the bonsai of valuable nutrients. Now is also time to clean up the grime and algae that built up during the winter months. Gentle brushing with a toothbrush and water on deciduous trees will be sufficient. Wire brushing junipers brings out the red pigment in the bark which contrasts nicely with whitened deadwood areas. Be careful not to overdo it. Do not brush Pines as the flaky plates are desired. Be alert for pests and diseases. Damp, warm conditions can cause mildew. Check for white chalky deposits. These can be controlled with a systemic fungicide. Aphids gather on the underside of leaves. Woolly aphids are often identified as small cotton wool like clusters at the base of needles, usually in pines, larch and junipers. Systemic insecticides should control most aphid and insect attacks. Do not spray in full sunshine. This is the flowering period for most spring flowering trees. Take time to enjoy the flowers. Remove flowers as they wilt, cutting back beyond the ovary. Allowing the tree to set seed will only sap more strength from the tree.